Silverhawk recently completed its second Citation full panel upgrade and Wi-Fi installation in N129MC. As was done with N812SH, this upgrade completely transforms the cockpit with the latest in Garmin avionics including a G600 PFD/MFD, Garmin radar, remote audio panels and transponders, and touchscreen GTN750 Nav/Coms. The G600 PFD allows pilots to see clearly in instrument conditions with synthetic vision, while also displaying XM weather, traffic, and charts. The touchscreen GTN750’s allow the planes to fly WAAS GPS approaches down to lower minimums than would otherwise be possible at smaller airports. All three sets of screens also greatly enhance situational awareness at busy airports with SafeTaxi displaying the aircraft position on the airport diagram. In addition to the many performance enhancements and added safety benefits, replacing the original avionics will also lead to greater reliability and reduced downtime and expense for maintenance. 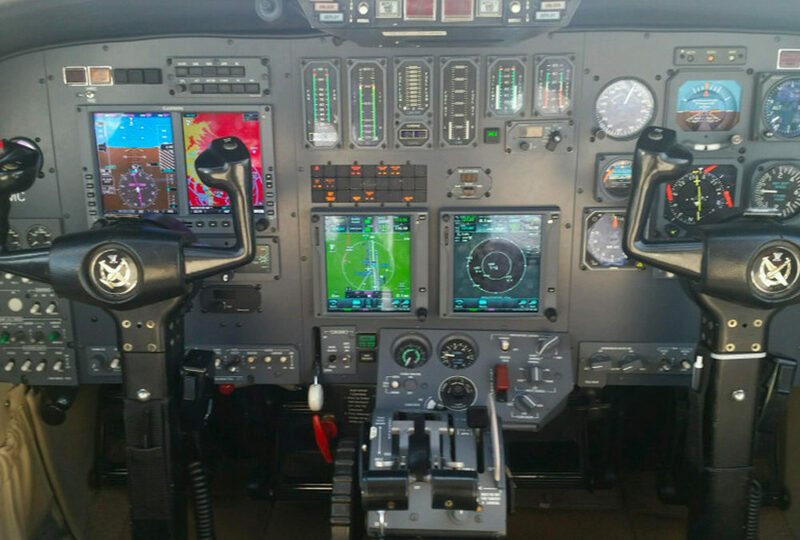 With the original equipment, we had found that avionics issues accounted for approximately 20% of our total maintenance costs, so this upgrade will eliminate a large portion of that amount. The addition of in-flight internet will also be a large benefit to our charter customers, allowing them to sends emails, text messages, surf the web, and make phone calls. Within another couple of months, this same upgrade will be completed on the third Citation V in our charter fleet. Having a standardized cockpit for our pilots with the latest technology available along with the freedom to stay connected in flight through on-board Wi-Fi will help us to continue providing the safest, most remarkable travel experience possible.